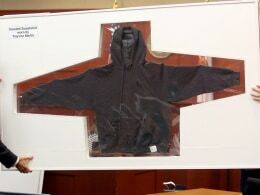 A state ballistics expert testified Wednesday that the bullet hole created by George Zimmerman’s 9-millimeter pistol was the result of a contact shot between the gun and Trayvon Martin’s sweatshirt. Further testimony confirmed that none of Martin’s DNA was found under Zimmerman’s fingernails or on his gun. Zimmerman has pleaded not guilty, saying he fired his gun in self-defense. NBC’s Ron Mott reports. >> another dramatic day in the second degree murder trial of george zimmerman . the jury got a good look at the physical evidence, like trayvon martin's clothing that night and the gun used to kill him. ron mott with the report from sanford, florida . >> reporter: today, jurors got an upclose look at trayvon martin's blood stained hoody and the bullet hole created by the .9 millimeter pistol. a contact shot. >> meaning the muzzle or the barrel of the gun was up against the sweatshirt when it was fired? >> a complete dna profile which matched george zimmerman . >> reporter: zimmerman 's were the only fingerprints on the gun and no dna of zimmerman 's found underneath trayvon's finger nails . and zimmerman aced a criminal litigation class. >> probably one of the better students in the class. >> 2010 course included discussions of florida 's self-defense law, commonly called stand your ground . contra vikting zimmerman 's tv interview, where he said he had no knowledge of the law. >> prior to this incident, had you even heard stand your ground ? >> reporter: zimmerman says he filed in self-defense. the witness testified that he taught that self-defense has its limits. >> we talked about imperfect self-defense, where you may have started out being the person that was attacked, but for whatever reason, you took it a step forward and now you are the aggressor. >> reporter: he told defense attorney don west the standard is imminent fear. >> you don't have to wait until you are almost dead before you can defend yourself? >> no. i would advise you don't do that. >> reporter: this brought a smile and chuckle from the defendant. court closed tomorrow for the fourth of july holiday. testimony resumes here on friday. ron mott, nbc news, sanford, florida .